Molly Sims has created a video that takes viewers behind the scenes for a first look as she decorates her new nursery for her first baby, due in June. The video is part of the Valspar Color Project, a three-part celebrity video series that also includes Lauren Conrad's design transformation of her Paper Crown offices and Padma Lakshmi's transformed kitchen, all to benefit Habitat For Humanity. Molly’s video has debuted on Valspar Paint’s Facebook Page, and every time her video is viewed or shared, Valspar will donate $1 to Habitat, raising money for their work helping low income families in need of affordable housing. 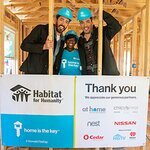 Each celebrity has set a personal goal of raising $100,000 for Habitat through views and shares of their Valspar Color Project video. This amount is in addition to the $3.2 million in cash and paint donations Valspar will make to Habitat for Humanity this year. Fashion designer and bestselling author Lauren Conrad joined the Valspar Color Project after spending several months surrounded by all white walls in her Paper Crown clothing line office in Los Angeles. She chose Valspar Brushed Rose, a dusty, romantic hue from her favorite color family, pink, to transform her office and bring cheer and inspiration to Paper Crown’s creative work space. Conrad, whose color transformation story will premiere on www.facebook.com/ValsparPaint in June, hopes that everyone will watch and share her video so she can reach her personal goal of raising $100,000 for Habitat for Humanity. Padma Lakshmi, award-winning cook book author, actress and television host, transformed a kitchen into a colorful culinary environment that inspires cooking and entertaining. She chose Valspar Fabulous Red, a color she loves because it is reminiscent of ripe tomatoes and red chilies off the vine. “A coat of paint in a room can do so much to inspire our imagination, and color is really important to a cook and to a kitchen because we eat first with our eyes,” noted Lakshmi. She too has set a personal goal of raising $100,000 through shares of her color story video, which premieres in July on www.facebook.com/ValsparPaint. The Valspar Color Project is part of an ongoing partnership between Valspar and Habitat for Humanity International. Valspar’s support for Habitat began in the mid-1980s, when it first provided paint and services to Habitat for Humanity Twin Cities. Since launching their national partnership in 2002, Valspar Paint has donated more than $40 million in cash and paint to Habitat. Valspar and Habitat recently marked their long-standing partnership by celebrating the 1 millionth gallon of Valspar Paint donated to Habitat.